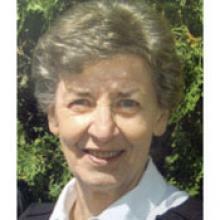 1939 – 2012 Yvette quietly began her walk with her Lord, Jesus Christ, on November 10, 2012. Yvette was born in St. Malo in 1939. She entered the workforce at the age of 17, working at Canada Packers for 30 years. She knew the value of hard work and loved to work hard. Upon the closure of the Packers, Yvette changed careers several times doing many, varied jobs including working as a caterer, a seamstress, and a cleaner of homes. Hobbies, such as woodworking, cross-stitching, baking, sewing, and painting kept her busy outside of her work. She was a consummate craftswoman and she displayed many of her paintings proudly in her home. As busy as she was, Yvette still found time to watch almost every game played by her beloved Blue Jays. Yvette enjoyed travelling with friends and family. She went to Austria twice, Montreal, Calgary, Toronto, Minneapolis, New England and most recently Arizona. Yvette treasured these times. Yvette is survived by her daughter Jocelyne and husband Scott, her son Alain and his wife Debi, her grandsons Erik and Glenn Radley, and her sisters Simone, Alice, Giselle, Lucienne, and Irene. Yvette loved all her nieces, nephews and cousins, and had a special place in her heart for Jeanette, Theresa, and Amanda. She was predeceased by her parents Arsene Lafantaisie and Louise Dore Lafantaisie, brother Ernest, and sister Elizabeth. While Yvette’s journey on this Earth has ended, her journey in the light of God has just begun. Peace be with you, Yvette! As per her wishes, cremation has taken place. Funeral mass will occur at 10:30 a.m., Saturday, November 17, 2012 at Blessed Sacrament Parish, 710 Roanoke Street, Transcona. The family would like to thank Dr. Johnston and the staff at Health Sciences Centre for their care and sensitivity. Donations, if you desire, can be made to CancerCare.